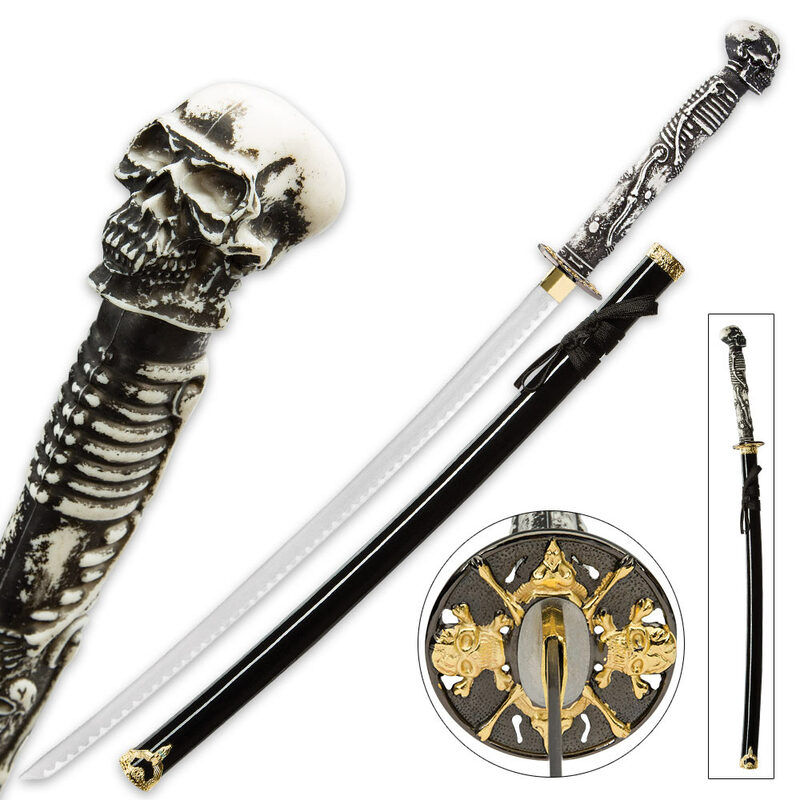 "Something Wicked" Skull and Bones Fantasy Katana Sword with Scabbard | BUDK.com - Knives & Swords At The Lowest Prices! Feeling a bit naughty? 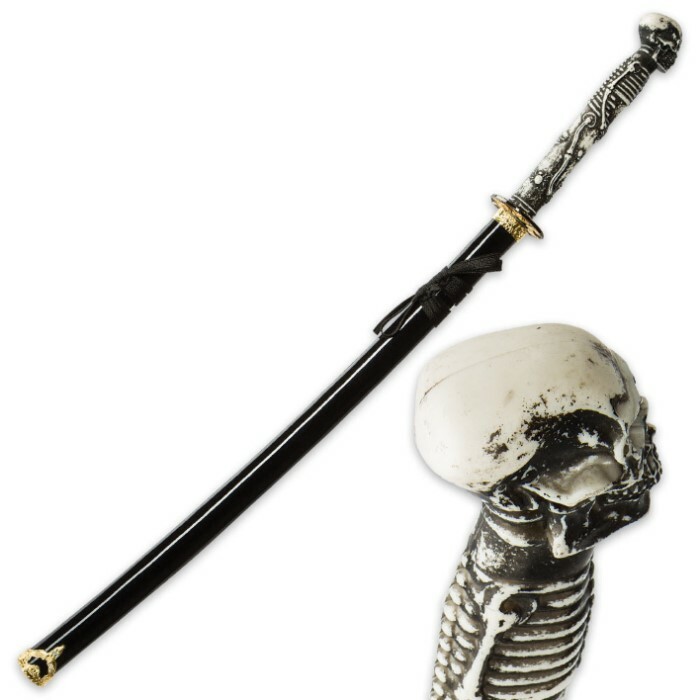 Pick up the "Something Wicked" Skull and Bones Katana and let loose those pinned up inner demons! 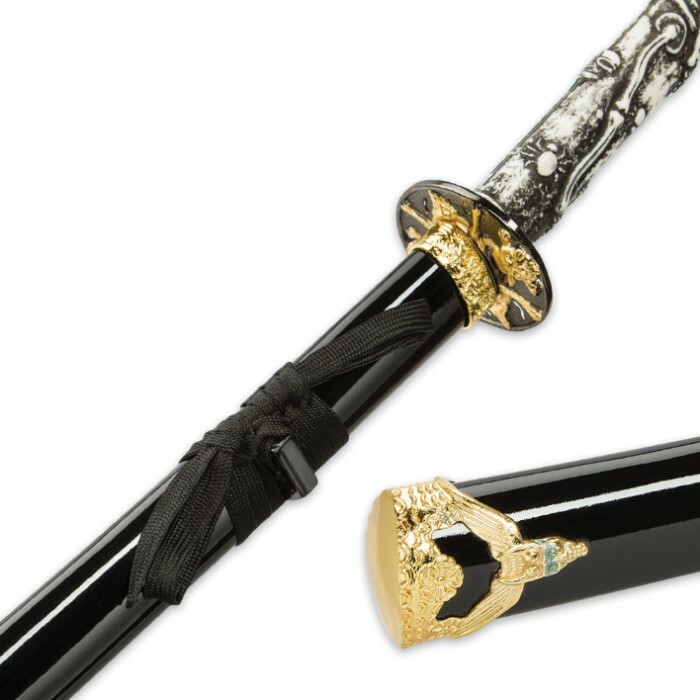 This "wicked-cool" fantasy samurai sword boasts a stout 26 1/2" stainless steel blade with a stylized hamon line. The aged white handle is intricately sculpted to look like a full human skeleton, complete with a realistic looking miniature human skull pommel. Fine details continue on the metal alloy guard - a subtle black ellipse offset with gleaming gold human skulls, femurs and other spooky accents. The polished black scabbard, with its elegant black ribbon wrappings, offers the perfect finishing touch to this macabre ensemble. At an impressive 39 1/2" overall, the "Something Wicked" Skull and Bones Sword looks great displayed on a sword stand, in a collection, on a wall, shelf or anywhere that could use some wickedly dark decor. It's also great for cosplay, theater or simply showing off to friends!